Last summer I gave a little course on something I really like: Jeffrey Morton and Jamie Vicary’s work on the ‘categorified Heisenberg algebra’ discovered by Mikhail Khovanov. It ties together combinatorics and the math of quantum theory in a fascinating way… related to nice old ideas, but revealing a new layer of structure. I blogged about that course here, with links to slides and references. • Spans and the categorified Heisenberg algebra. of a talk at the Catégories, Logiques, Etc… seminar at Paris 7, run by Anatole Khelif. This should be a fairly painless introduction to the subject, since I sensed that lots of people in the audience wanted me to start by explaining prerequisites: categorification, TQFTs, 2-Hilbert spaces and the Heisenberg algebra. That means I didn’t manage to discuss other interesting things, like the definition of symmetric monoidal bicategory, or the role of combinatorics, especially Young diagrams. For those, go here and check out the links! Olivia Caramello, Caractérisation d’invariants toposiques en termes de sites, January 16, 2013. Olivia Caramello, Théorie de Galois topologique, January 15, 2013. Laurent Lafforgue, Introduction au programme de Langlands et relation avec la théorie de Caramello, February 27, 2013. If you’re interested in IRCAM or how Moreno Andreatta, Alexandre Popoff and Andrée Ehresmann are working on music theory with the help of categories, you can read a bit about it here. 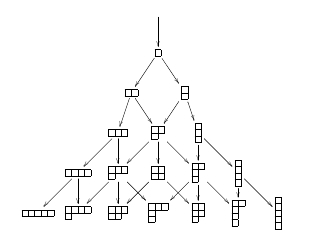 To make a long story short: a Klumpenhouwer network is a group under a diagram and over SetSet. I just got to look at the very nice slides for the talk with the same title as this post. From there I went to Mike Stay’s paper on the same subject, and I agree with John that the pictures are terrific! The hexagonator diagrams are particularly interesting since they turn out to be the polytopes known as cyclohedra. (Here’s an encyclopedia entry that I’ve put together mentioning that fact.) Also in the encyclopedia entry are some links to other places that these polytopes crop up, in operad theory, graph theory and cluster algebras. Interestingly, the vertex labels from the operad point of view are close but not quite the same as the ones in Mike’s paper, from the viewpoint of braided monoidal bicategories. The vertices for the hexagon in operad theory would be labeled by (AB)C, A(BC), (BC)A, B(CA), (CA)B and C(AB). Compare those to the ones on page 15 of Mike’s paper. Mysterious. The appearance of this polytope is explained by it being the result of contracting edges in another polytope - the one labeled permutahedron in your link (a truncated octahedron) which is really just the graph of 2-morphisms on a 4-cube. The 4-cube in question is the image of a 4-cube of finite sets when you view this whole system as a functor from finite sets. The hexagons correspond to the sub 3-cubes and the squares correspond to the bicategory isomorphisms which “glue them together”. Have the lectures of these two weeks been filmed? Will they soon be online ? I meant the workshop on operads, not the Khelif seminar. They were filmed by Michael Wright, but I don’t think you can expect to see them anytime soon.